Funemployed goes beyond the press releases and the hype to show what it’s really like to be a working artist in Australia. Through candid interviews, brutal honesty and lacerating wit, Justin Heazlewood (aka The Bedroom Philosopher) provides a fascinating portrait of life in Australia for artists and aspiring artists alike. Justin explores every dark corner of the arts. From starting out to giving up; running a business to burning out; the trappings of fame to the advantages of failure; the obstacles and opportunities. This is a landmark book, written with the raw passion of someone with over a decade in the ‘trade’. Part confessional and part rogue self-help book, Funemployed is a wholly fascinating insight for everyone who appreciates the arts in Australia. 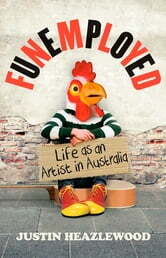 Funemployed includes interviews with over 100 artists Gotye (Wally De Backer), Clare Bowditch, John Safran, Tony Martin, Amanda Palmer, Christos Tsiolkas, Tim Rogers, Adam Elliot and Benjamin Law.